Armentieres was occupied by the 4th Division on 17 October 1914 and it remained within the Allied lines until its evacuation ahead of the German advance on 10 April 1918, after a prolonged and heavy bombardment with gas shell. It was occupied by the Germans next day, and was not recovered until 3 October 1918. 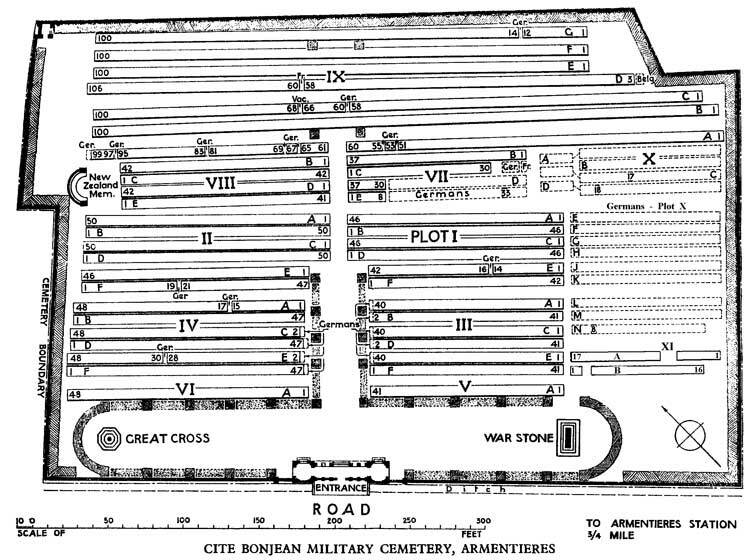 CITE BONJEAN MILITARY CEMETERY was begun (Plot IX) in October 1914 and during the winter of 1914-15 it was used for civilian burials (later removed), the town cemetery at Le Bizet being too greatly exposed. The cemetery continued to be used by field ambulances and fighting units (particularly the 4th, 6th, 21st, New Zealand, 17th and 57th (West Lancashire) Divisions and the Australian Corps) until April 1918. Plots V, VI, VII and X were then used by the Germans. The cemetery now contains 2,132 Commonwealth burials of the First World War. In 1925, 455 German graves were removed from Plots V and VI, but more than 500 remain in the cemetery. There are also 33 Second World War burials, mostly dating from the months of occupation by the British Expeditionary Force, before the German invasion of May 1940. Within the cemetery stands the CITE BONJEAN (NEW ZEALAND) MEMORIAL, commemorating 47 officers and men of the New Zealand Division who died in the neighbourhood of Armentieres and have no known grave. This is one of seven memorials in France and Belgium to those New Zealand soldiers who died on the Western Front and whose graves are not known. The memorials are all in cemeteries chosen as appropriate to the fighting in which the men died. The cemetery and memorial were designed by Sir Herbert Baker.